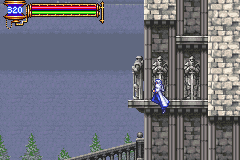 Castlevania: Aria of Sorrow is a great game. It’s the culmination of everything Konami learned from the wild experiment of Symphony of the Night, and the beginning of a new experiment. It was the first time since the previously mentioned SotN that Konami decided to experiment with the formula, rather than simply refine it. And that experimentation led to the next great evolution of the series. 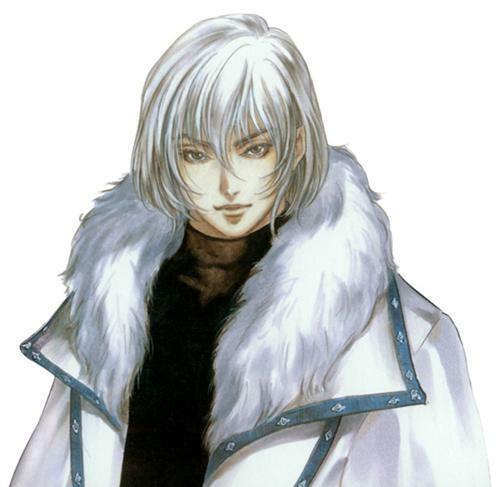 Castlevania: Aria of Sorrow begins with a man named Soma Cruz, a transfer student in Japan climbing to the top of the Hakuba Shrine to witness the solar eclipse in 2035 (Don’t be alarmed; the game may start in Japan, but that has no real influence on the plot or design). Somehow, at the point of the eclipse, he is drawn into Dracula’s Castle where he comes across Mina Hark– I mean, Mina Hakuba, a personal friend of Soma’s, and a strange man named Genya Arikadyo. Genya tells Soma that he has the ability to absorb the powers of the monsters in the castle, which Soma promptly goes out to explore. Even on my second playthrough, I’m still not entirely clear on why Soma wants to make his way through the castle, other than it’s the only thing to do. 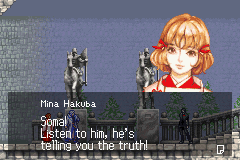 That particular plot hole is easily ignored, however, as the mechanics of Soma’s powers become apparent. It also becomes much easier to ignore as more plot details are revealed, but we’ll get to that later. The game’s main hook is the Tactical Soul System (aka Soma’s super powers). Every enemy has an ability you can steal upon their death. It won’t happen every time, though. In fact, you may have to beat the enemy 100 times to get their power, as it’s a random event. That being said, there’s often little reason to find a way to beat enemies over and over, as the powers that you need to complete the game are given to you fairly frequently. But you’ll get enough powers that you like that you’ll want to see what other cool abilities you can get. And, when you don’t get one enemy’s powers, you think, “Maybe next time.” Yeah, it’s got a Pokémon-like addictive quality. There are four kinds of powers: Bullet, Guardian, Enchant and Ability souls. Bullet souls take the form of classic Castlevania subweapons, like Axes and Knives, and new abilities like throwing bones and cats. All Bullet abilities take a predetermined chunk of your magic meter (which replaces hearts this time around). Guardian souls summon familiars, and occasionally activate special moves at the cost of draining the magic meter while in use. Enchant souls are either stat boosts or abilities that you are only meant to use at certain times (so you can turn them off). Abilities are just there; they take the form of the classic Double Jump (among others), and there’s no need to go into the menu to turn them off, even though you can. Neither Enchant nor Ability powers drain your magic meter. The presentation is in line with the very best on the Game Boy Advance. 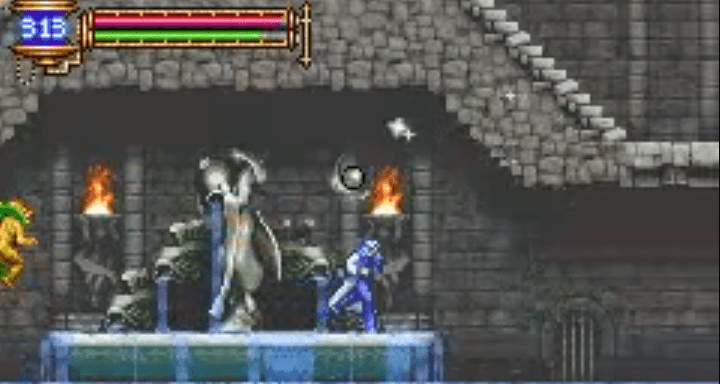 The first GBA game, Circle of the Moon, had pretty good music, but merely average visuals. The second GBA game, Harmony of Dissonance, had great visuals, but its music had more in common with dissonance than harmony. 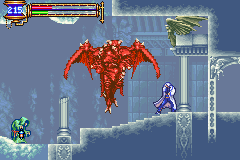 Aria of Sorrow runs off the same engine as Harmony, preserving the great visuals, and brought great music back to the Castlevania franchise. 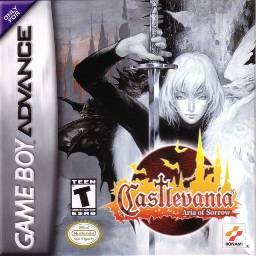 It may have taken three games, but Aria of Sorrow was a GBA masterpiece from a presentation standpoint. Other than that, it’s typical Metroidvania fare, and, considering that Castlevania added the “vania” to that genre, that’s fine with me. 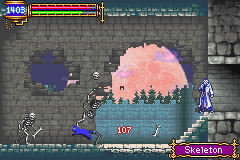 You’ll go through the castle, level up, and collect new powers that give increasingly more options to explore. And, given that this is a Castlevania game post-Symphony of the Night, there are hidden alternate endings. This one’s as deviously placed as the one in SotN. Let me give you a little clue without spoiling anything: you’ll find three books in the castle. Those books tell you three powers you need before you fight the first big boss. That’s the end of any spoilers here, but let it be known now that, on the next page, I will spoil this like year-old milk. So, if you don’t want to be spoiled, stop now.